Content is the most important characteristic of a sacred song. Most members of a congregation are not trained singers, so unfamiliar music hinders them in their worship. Taken together, these three things indicate that the most useful songs for the congregation contain good content in a highly structured form with music that is as easy to learn as possible. I don’t think it’s any accident that this description matches many of the best traditional hymns. After all, traditional hymn form didn’t fall from the sky, nor was it defined by the Pope. Instead, it evolved in response to the needs of worshipers. 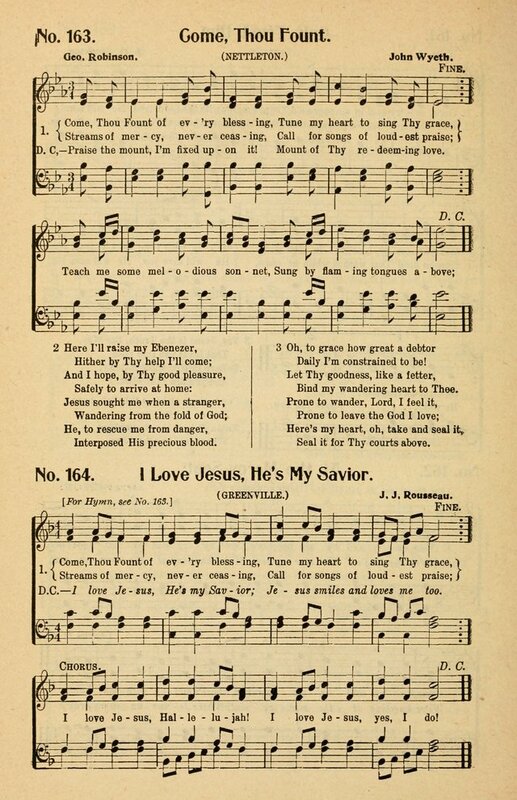 Not surprisingly, hymns bear considerable formal similarity to secular folk song. In both cases, the circumstances demand a lyrical and musical expression that ordinary people can easily sing together. Consider, for instance, the hymn standard “O Thou Fount of Every Blessing”. Like all hymn texts that have survived from the eighteenth century, the lyrics are in a regular meter. This is critically important. Regular meter allows congregations to sing multiple verses with different content to the same four-phrase tune. Without perfect meter, one of three things would happen to “O Thou Fount”. The tune would have to be through-composed, which (given the same three verses of content) would require the congregation to learn three times as much music to worship with equal content. Frankly, why make non-singers jump through that hoop? The lyrics would have to contain lots of repetition to allow for musical repetition. As long as you’re singing the same words, you can use the same music (which is why many contemporary praise songs are repetitive). However, past a certain point, repetition limits content, thereby violating Rule 1. If you’re not singing a sacred song for the content, why are you singing it? The tune would have to be an imperfect match to different verses with irregular meter. Broken meter (when the meter varies from verse to verse) is kryptonite for congregational singing. It causes problems even in otherwise excellent hymns such as “Follow Me”. When severe, it can make hymns with strong content, such as “The Ninety and Nine”, practically unsingable. Congregations much prefer to worship with hymns with regular meter because regular meter allows them to focus on content rather than rhythm, worship rather than singing. We see then, that the simple decision to use regular meter makes “O Thou Fount” economical in its musical demands on the congregation. The tune, NETTLETON is similarly economical. It’s written in rounded-bar form. In other words, the first, second, and fourth musical phrases are identical, with the third phrase offering a musical variation. As a result, in order to sing a full eight-line hymn (with multiple verses), the congregation only has to learn two musical phrases (one of which repeats itself three times). Again, all other things being equal, a rounded-bar hymn tune will be twice as easy to learn as a tune of similar length with four dissimilar phrases. As a result, “O Thou Fount” reduces musical demand both with repetition across verses and with repetition within verses. Imagine again our one-verse, 24-line version of “O Thou Fount”. To sing it, the congregation has to learn twelve phrases of music—six times as many as in the version we actually sing. Song-introducers who demand that the congregation learn six times as much music for the same content clearly care more about music than content and have missed the point of worship. The formula has worked for centuries, and it still works today. Look at the work of Stuart Townend and Keith and Kristyn Getty. What do you see over and over again? “In Christ Alone”? Regular meter, multiple verses, rounded-bar hymn tune. “O Church, Arise”? Regular meter, multiple verses, rounded-bar hymn tune. “How Deep the Father’s Love for Us”? Regular meter, multiple verses, rounded-bar hymn tune. The same thing is true of “Jesus, Draw Me Ever Nearer” (Getty tune, lyrics by Margaret Becker). Regular meter, multiple verses, rounded-bar hymn tune. Congregations love these hymns because they are extremely easy even for non-singers to pick up, and the Townend-Getty circle has been smart enough to spot the pattern and exploit it. Of course, the right form will get you only so far. As a rule, Townend-Getty hymns have strong, appealing content to go with congregation-friendly form. It’s possible to write vast numbers of hymns with regular meter, multiple verses, and a rounded-bar hymn tune, yet never produce anything the congregation wants to sing. However, the farther one departs from the form, the more likely one is to write a sacred song that the congregation can’t sing (at least easily, sometimes at all), regardless of how much they might want to. If you’re a lyricist or a composer, write this way, or in another way that is similarly undemanding and economical. If you’re a song-selector who is concerned with congregational singing, look for works written in this way or in a way that is similarly economical. If you don’t, you are unwittingly building barriers between your chosen hymn and its enthusiastic adoption.